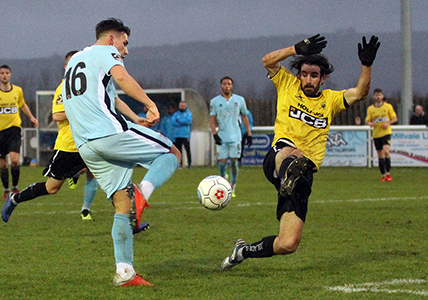 Following the euphoria of the Torquay United win a week previous, Bath weren’t exactly brought back down to earth, but found Gloucester a tough nut to crack in a match dictated by a bumpy pitch and windy conditions at the Tigers’ temporary Jubilee Stadium. In the end, the opposition’s failure from the penalty spot once again proved crucial for the Somerset outfit, who would have been mightily unfortunate had it decided the contest. Jerry Gill made three changes with Kevin Amankwaah and Sean Rigg injured and Ross Stearn left out for tactical reasons. In came debutant Joe Romanski – newly on loan from Swindon Town – James Morton and ex-Tiger Adam Mann, the latter at his old stomping ground having netted 24 times for Evesham last term, plus a decent return of seven this. Morton, in contrast, hasn’t scored at all for Bath. He had the Romans’ first effort on goal, blazing over with Leon Davies following suit soon after. Gloucester struggled to make inroads in contrast, the division’s weakest attack leaving Bath’s backline largely untroubled with one of City’s defenders, Robbie Cundy, a former Gloucester player, glancing wide at the other end. Frankie Artus saw his looping header nodded off the line on the half-hour, before the home side wasted a golden opportunity to open the scoring five minutes later. Jake Jackson burst clear and in attempting to round Ryan Clarke, went to ground following the goalkeeper’s reach for the ball, with referee Daniel Lamport pointing to the spot despite the fall appearing rather theatrical. Clarke was cautioned but gained his revenge moments later when Jackson’s weak penalty was easily palmed away by the City stopper, Romanski quickest to clear the loose ball. The blustery setting in Gloucester’s open Worcestershire base were prevalent three minutes before the interval when home number one Jojo Wollacott saw his raking clearance skip off the surface and bounce just over. Freddie Hinds had the half’s last chance, heading Jack Batten’s driven cross wide following the centre-back’s foray forward. City’s attacking threat improved after the break, with Wollacott, a former Bath keeper, smothering Mann’s long-range strike. Hinds thought he’d broken the deadlock when Joe Raynes slipped him through on goal, followed by a neat finish, but the offside flag cut short his celebrations. A decent save from Wollacott again frustrated the Bristol City loanee, who often drifted out wide to positive effect. Ryan Brunt was introduced to add more power to the City attack with Davies limping off, allowing Raynes to switch to a wing-back role. Gill’s men were given room in the midfield, with Morton largely dictating play, but getting through a well-organised defence proved more troublesome. Although City forced a catalogue of corners, totalling double figures by the end, they couldn’t make any of them count with Gloucester defending for their lives, none more so than Jake Mawford, a usual striker switched to left-back, superbly throwing himself in the way of Raynes’ goalbound effort when, for once, the rest of his back four slumbered. Raynes was again involved in arguably Bath’s best chance, teeing up Brunt, but he couldn’t repeat his heroics of the previous week, blasting over from ten yards. Harry Williams was introduced for Gloucester in the final quarter hour to give Bath a bit of a runaround at the back, but Clarke was a virtual spectator in the second half, vision possibly impaired by the torrential rain. Following last week’s epic contest with Torquay, the quality failed to reach the same level, with Gloucester now failing to score in exactly half of their league games – recording five 0-0s in the process – but in contrast recorded a third clean sheet in a row under new boss Mike Cook. City have four successive shut-outs away for the first time in over a decade and now boast the league’s best defensive record. 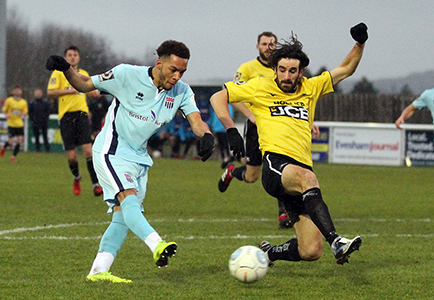 It also confirms their unbeaten January in National League South and, sitting eight points clear in the play-off berths, the Romans should be hugely satisfied being in such a promising position with a third of the season remaining. City’s Line-Up: Clarke, Straker (c), Batten, Artus, Hinds, Mann, Cundy, Raynes, Romanski, Morton, Davies (Brunt 57). Subs not used: Watkins, Stearn, Brunt, H Wiles-Richards. Scorers: City – none; Gloucester – none.